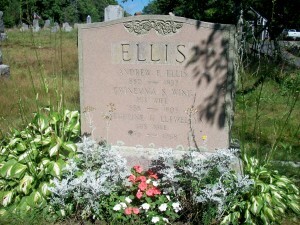 Born: April 1, 1850 in Pocasset Ma. 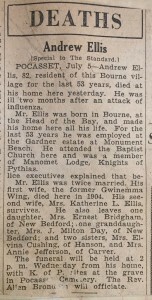 Died: July 3, 1932 in Bourne Ma. at 82 yrs, 3 mos, 3 d.
1. 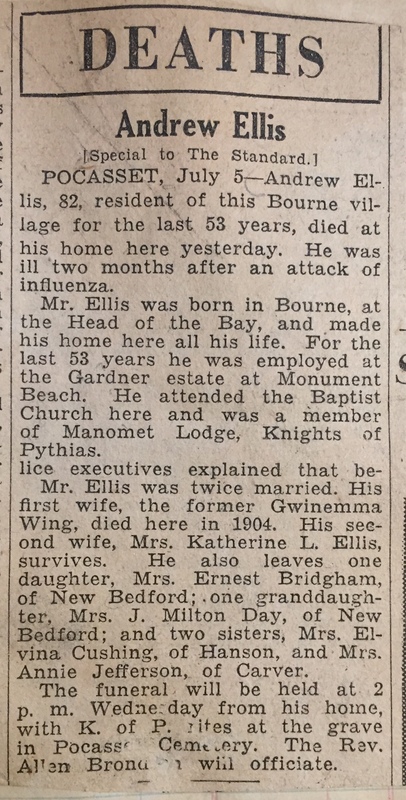 Annie Foster Ellis Bridgham; (November 14, 1877 – June 24, 1971); Married Ernest Guy Bridgham (1875 – 1964) (Joshua L. Bridgham & Angie G. Smith) in Bourne Ma. on June 4, 1901; Annie & Ernest are buried in Pocasset Cemetery.